Twice a month I get together with a fierce and fabulous group of women. (Remember?) Last week for our social, we went to a Paint Nite event. This is one of those things I've seen online forever and have always wanted to try out. I'm fairly certain my artistic abilities peaked somewhere around the third grade but pretty much any event that includes wine, a bar, and my girlfriends is bound to be a good time. If you've never heard of Paint Nite, it works like this. The event will be hosted in a bar or restaurant and the instructor will lead you step by step in creating a painting that you take home. Everyone at the event paints the same painting and you can see what painting you will be doing when you book your tickets online. The paintings range in skill level from easy to difficult. Thankfully, we picked a painting event that was painting an "easy" painting. So, we met up for our event at the Hard Rock Café. It was the largest event ever in Toronto with 60 attendees! 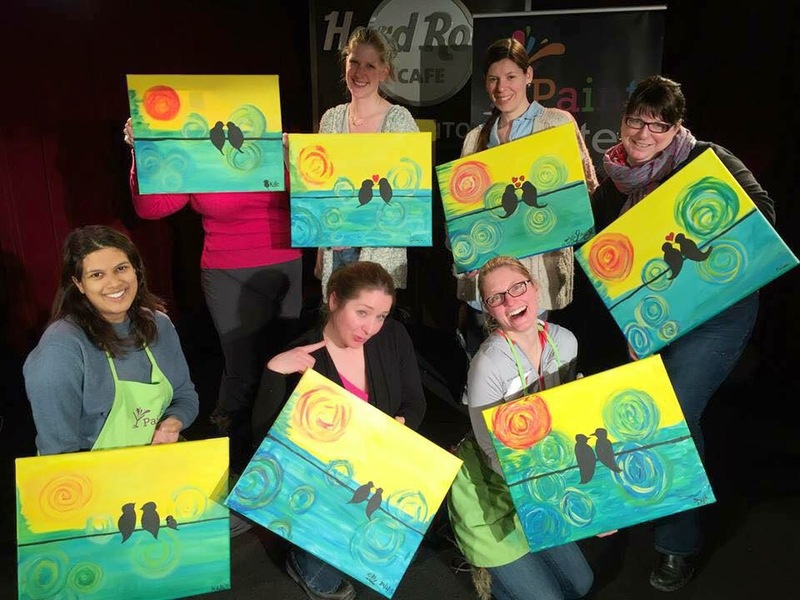 Armed with a paintbrush in one hand and a glass of wine in another, we vowed to have a great time and to not whine about our paintings not being perfect. This event turned out to be so much more fun than I think any of us thought it would be. We laughed all night long, and it was so fun to see how everyone's paintings were the same picture but each slightly unique. Our instructors, Jon and Lexie, were hilarious and willing to help with whatever we needed throughout the night. What you get when you mix paint and wine. I have to say, I'm pretty proud of how my painting turned out. "Swirly Birds on a Wire" it's called. I would absolutely do this event again. Plus I felt pretty validated the next morning when Seb could immediately identify 2 birds and a heart. So yeah, it looks like what it's supposed to look like! Seb was actually so excited about the painting that he wanted it up in his room (melt my heart). If you're looking for a fun girls' night or a new thing to try for date night, I highly recommend Paint Nite. Google around for discount codes when you place your order. I use the one PAINTNITECA for 40% off. Baby and Toddler Scientists Wanted!